Those who know me a little more than as an infrequent contributor to Black Gate Magazine might be aware that I once aspired to be a writer of fantasy stories and novels, even publishing (for a short time but longer than average life expectancy) a small press magazine with co-editor and lifelong friend Nick Ozment. 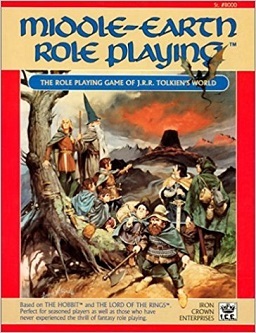 A few years into my forties, however, roleplaying games have utterly subsumed my creative life. I’m currently gamemastering four games: my home game, the very first roleplaying game I ever ran in my young life, Middle-Earth Role Playing (MERP); another MERP game, this one using full Rolemaster rules (2nd edition), via play-by-post (PbP) in a G+ community; and two Modiphius Conan 2d20 games, one via PbP in a G+ community and one (same format) in a Facebook group. This last one is being conducted with Bob Byrne and Martin and Xander Page and is the subject of a new Modular series helmed by Mr. Byrne. In preparing my observations on Modiphius’s licensed Conan property, I have been thinking deeply about various… I suppose I shall call them “styles” of play. Using what I consider two fairly representative rules sets of what I mean by play “styles,” I have done a pretty extensive breakdown here. I expect I also shall have occasion to write about different styles of play in the midst of my experience with the 2d20 playtest. Right now, though, I want to talk about what can be termed the OSR (Old School Revival) — perhaps more accurately referred to as DIY (Do It Yourself) — resources that I most appreciate and are the most often used in my MERP games. Specifically, these resources help me come up with content and develop my fantasy world. There are a number of “adventure generators” — perhaps more accurately described as “idea machines” — out there. I’m sure all of them are fantastic. You can download one for free from Astonishing Swordsmen & Sorcerers of Hyperborea at its website Hyperborea.tv. Nearly all of the products and producers that I’m going to mention in this article offer one. Even Conan 2d20 has one, though the focus of that generator, due to the nature of play that Conan encourages, is a bit different, and I expect I will analyze this at length when I get to that portion of the official playtest series. These “adventure generators” almost certainly are evolved from the “story creators” that Ozment once told me that the early pulp writers used, sometimes flicking spinners rather than throwing dice. Hey, modern GMs are under almost the same kind of pressure as those pulp writers were, though instead of needing to churn out words for pennies to put meat on the table they need to come up with an idea quick, tonight, before the players come over expecting to be wowed and entertained. Pre-made modules can do the same thing, of course, but they have to be studied first, details have to be remembered, and sometimes they just don’t work with the ongoing campaign in the way that a few randomly generated elements can result in truly inspired serendipity. All of the products I’m about to profile I own and use in PDF. I can’t find publication dates attached to some of the other products I own, so I’m not sure if I can call this one the “first,” though it certainly is first to me. When I got a hold of this book I went crazy with it, rolling on table after table to come up with a welter of ideas, locations and dungeon features that coalesced, sometimes, into the craziest of adventures. I even used it while I was running a “low-fantasy” Viking game using Yggdrasill to generate random encounters. That earlier term “crazy,” though, points to some of the limitations — for my own personal purposes — of this massive tome. I’m not sure if it’s because of a pervasive and implicit tone, based on Finch’s own preferences for old school Dungeons & Dragons, or if it has something to do with how I personally am receiving the table results, but a lot of the generation seems to result in what I would call “gonzo” or “super-fantastic” D&D — something that totally works for adventures using something like Dungeon Crawl Classics but not, perhaps, well, in Middle-earth. I also really should own this book in hard copy. I have it in PDF, and, though it’s broken into discrete, easily-navigable sections if one is using Acrobat Reader, there still is a lot on one page and requires that the user has every nomination of D&D dice in the full set on hand. Still, I couldn’t live without this book. It has everything in it. Everything. 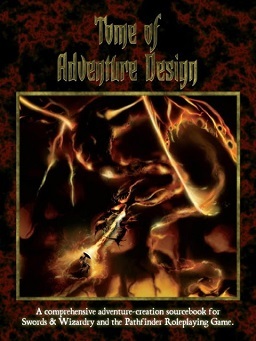 The book is organized into four parts: Principles and Starting Points, Monsters, Dungeon Design, and Non-Dungeon Adventure Design. This book provides tables for everything from coming up with a “plot” and NPCs to mapping out a dungeon and stocking it with everything from Monsters, Treasure, Tricks and Traps to Smells. It’s super fun to explore and certainly contains more tables than are in some of the other products I’m about to mention. Here are descriptions of two dungeons I designed after using Finch’s tables for random results. To come up with the first dungeon, the Octahedron Temple, I used little more than the specific dungeon generation tables. My ambitions rose for the second dungeon: I used virtually every table in the book. These dungeons were for my very short lived Swords & Wizardry campaign. It ended mostly because a friend of mine started running a legit old school AD&D campaign: we didn’t feel like we needed two D&D games in tandem. Also, my players didn’t appreciate how “hair trigger” my traps were. I kept forgetting that, in original D&D, traps only spring 2 out of 6 times. Needless to say, PC corpses were stacking up like cordwood. I confess I exulted a little overmuch in the lethality of old school play. In the Wizard’s Maid tavern, Langlaua, an assassin, comes in with a map, a code, and a key (the ring in the shape of an octagon, the tines enclosed in an octahedron that will release them when placed in its lock) that she spent all of her money in diverting from going into the hands of the Cleric whom her Guild master serves. She wants to impress both by discovering something that the Cleric might use for his evil plans. Having no money, she can’t hire, but she’s willing to “split the spoils” with only three PCs. Background of Dungeon: Rumors are that this octahedron temple was built by planar travelers with human heads and torsos, wings, leeches for arms and legs, and that their bodies frequently crawled with leeches and worms. These planar travelers were beneficent patrons to a number of clerics who gathered around them. After the planar travelers left during the Nighttimes, the remaining clerics, trapped in the redoubt of their octahedron temple, offering sacrifices to the creatures of the air in propitiation for them being spared, sought even greater assurances by attempting to summon beings whom they might control from another plane of reality, hoping for something much like their vanished benefactors. However, they made an error and actually summoned the egg of a monstrous creature from an alien planet (the remains of this ovoid can be found in Area 2 of the dungeon). What escaped from this egg is a monster incredibly adept at surviving in a new planet by genetically altering organic hosts. By the time the adventurers enter this dungeon, the horrors have taken full control of both their hosts and their environment. They wait to determine what to do next. It might be that they don’t even know a way out of the dungeon. Ages ago, when the kinfolk retreated into their redoubts, a princess (her original homeland and details about her family long forgotten) came to the Forest Redoubt with her retinue. It soon was learned that she had been touched by the Malevolents without: her flesh was turning to glass. Princess Bellaflore (for such was her name) had a passion for flora. She gave all of her riches to the Druidic Order of Llamatron who governed the Forest Redoubt and then committed herself to the task of constructing sprawling gardens on some of the massive interior branches of the stronghold. In time she died, her internal systems failing well before she had turned completely to glass. As the disease completed its metamorphosis of her body, she was placed on an open bier in the center of her most beloved garden. In time — and it is not certain how this happened — her body of glass was shattered. Her relics are now housed somewhere hidden by the Order of Llamatron (who probably is more concerned with suppressing the growing Cult of Bellaflore because of its distraction from Neutral Nature rather than to protect the relics from further profanation). In doing so, it was discovered that, within Bellaflore’s farm, Bellaflore’s broken hands and fingers could be used to expertly splice plants together into new combinations and powers. Bellaflore’s unscrupulous family, inheriting her estate, allow the Order of Llamatron to experiment with this in exchange for a share in their creations, which they use to make money in gladiatorial combat in the upper reaches of the garden. One prominent member of the Order gambles too much. An apothecary, who works in the garden, happened to overhear plans for a particularly nasty plant that is going to assassinate a plant handler during a combat. The apothecary can’t allow this to happen, since the druid he serves relies on this particular handler for tips. He wants the PCs to discretely stop this first attempt and is willing to provide them with potions that increase their resistances in certain situations. Looking again at these descriptions now almost a year after creating them, it’s clear to me that, for these, I added use of one of Kent David Kelly’s Oldskull products described in more detail below. Many of the names in the afore described dungeons most probably were generated using Kent David Kelly’s Dungeon Delver Enhancer. 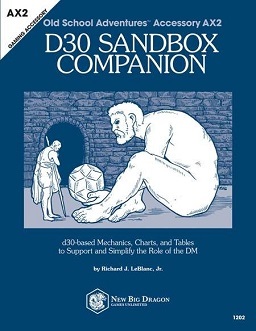 d30 DM Companion and d30 Sandbox Companion by Richard J. LeBlanc, Jr. These two sourcebooks are virtually nothing but tables using rolls exclusively of a d30. (Don’t have a d30? Neither do I! Just use a d6 and a d10.) 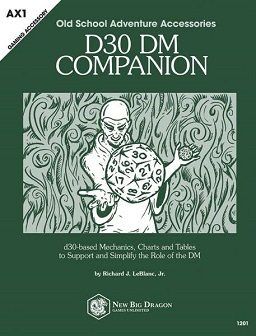 The DM Companion contains quick generators of Dungeon Features, Monster Encounters, and Treasure — all pretty standard and (unfortunately for me) fairly specific to d20 rules and scale. The product I really love, however, and absolutely can’t be without, is the Sandbox Companion! This one has two tables (ten columns) of Adventure Generators and is much more streamlined if one doesn’t have time to get buried in Finch’s massive Tome. It also contains tables for Wilderness and Adventure Locales, tables for Settlements, and tables for NPCs. Now these three categories broadly cover many, many useful tables anywhere from Heraldry Generators to Methods of Torture and Execution to NPC Physical Traits. My favorite use of this book, however, is for generating urban areas. For the PbP MERP game I just started, I created a town of population 90 that offers, for sale and services, fletching, leatherworking, provisioning, resale, sage advice, general smithing, tailoring, and tool-equipping. It also, of course, contains an inn, called The Stinking Dwarf (a name like that just cried for a backstory/explanation! ): new, one-story, built of timber and stone, offering small rooms containing straw mattresses, furniture of elven construction (which I removed due to setting), prejudiced towards Halflings (also removed), which speciality is roast pig stuffed with cheese and chestnuts. Both of these books also come with handy printable worksheets for both dungeon and world mapping. I should add that the whole are so printer-friendly and precise that it is easy to print them out to have always easily accessible at your table. The hex maps and worksheets also are obtainable for free in a separate package here. I should add that I expanded on details for my village described above by turning to another one of Kent David Kelly’s products. He has a lot of them, and he keeps adding to them all the time, and he routinely offers them for sale at DriveThruRPG and RPGNow (the d30 and Oldskull images are linked to DriveThruRPG) at absolute steals. The last sale of which I took advantage had most of Kelly’s catalogue going for 99 cents a book! 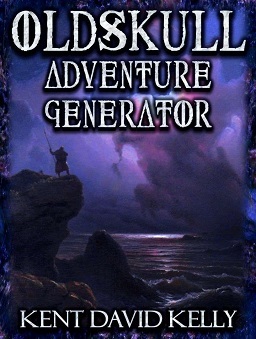 Again, I have a lot of these resources, and dip into many of them often, but the one I’m using more and more these days is the Oldskull Adventure Generator. The tables are much like Finch’s and more expansive than what is concisely presented in the d30 Sandbox Companion but are so neatly and sequentially presented and so easily accessible on Acrobat Reader that I simply roll, roll, roll down the line, recording my results in pencil in a notebook to come up with some amazing results. And, I don’t know why, but the ideas generated seem less “super-fantasy” than those built using the Tome, so much so that I’m tempted to call the generator “setting agnostic.” I would share some of my results as I did with my use of Finch’s book, but they are so fresh that I’m worried about spoilers lest some of my players read this. It’s interesting to compare Finch’s method of random dungeon generation to Kelly’s in his Oldskull Dungeon Generator. Finch provides intricate tables to organize dungeons into “areas,” and each of these “areas” is given a shape that Finch describes alongside his random tables. The number and size of rooms in an area also is the result of random tables. Moreover, Finch provides tables that not only can be used to randomly generate the title of the overall adventure (demonstrated by my generation samples above) but also the names of locations and, specifically, dungeon areas. Naming specific dungeon areas helps to give it a specific theme and tone, but sometimes the name is so bizarre that it’s difficult to come up with something that fits. Kelly, in his Oldskull Adventure Generator, also provides tables for adventure titles, but for dungeon areas — or even specific rooms — he provides tables that give descriptions only. As far as random dungeon generation goes, Kelly’s Oldskull Dungeon Generator is a perfect accessory to the adventure generator. Whereas Finch provides random tables that allow the user to arrange a variety of dungeon areas, Kelly’s dungeon generator starts with a starting area and then randomly generates the dungeon as one explores corridors and opens doors into rooms. What’s in a room (if anything) is contingent on another roll on a specific table, and often these results point the reader, for more definition, to other Oldskull resources. Finch doesn’t have anything so definitive — though, granted, this isn’t his purpose: Finch merely says that half of all dungeon rooms should be more or less “empty.” This advice is reflected in Kelly’s defined tables. In fact, as long as a group embraces a bunch of random “crazy,” Kelly’s tables can be used to generate the necessaries for a game session on the fly, in “real time.” It also can be used (with some house rules and established conventions) for solo play. The journey literally becomes the destination, but the destination has no resolution. That might be too much of a shock for plot-oriented players, who we are already potentially upsetting with the outlandish notion that “plot” isn’t what the GM tells the players they should be doing; it’s what happens whenever the players tell the GM what they want to do! In conclusion, though I own many, many OSR/DIY products, and many of them are great reading and highly worth your time, those profiled here are my favorites and the ones that, personally, I find the most useful. As noted, Conan 2d20 provides resources similar to these, but the nature of that game is slightly different to the style of play that these products support, and I shall cover 2d20’s contributions in the regular series being formed by Byrne, Page and myself. My personal favorite remains the AD&D 2e World Builder’s Guidebook, which does a really nice job of walking through the process of designing anything from a small region to an entire planet, and which is actually very system-agnostic — I think the closest it comes to D&D-specific is a table that gives a list of possible intelligent races, which you could certainly edit or ignore. Bob: haha! It’s almost become a matter of principle for me to absolutely refuse to write out Robert E Howard’s Conan Adventures in an Age Undreamed Of. Maybe REHCAiaAUO? On a related note, in an interview Jeff Talanian said he now wishes he had titled AS&SH something slightly shorter and more accessible. Joe: Thanks for the recommendation! I’m always looking for more! I’m going to see if this has been made available on DriveThruRPG. I also should familiarize myself with the good ol’ DMG. But I haven’t since I’m a player in someone else’s campaign. The things I’ve been hearing, though. Random harlot generation tables?! Frog God Games produced the very cool ‘Borderland Provinces Adventure Generator’ as part of their ‘Borderland Provinces’ entry in The Lost Lands. It had a bunch of tables for making adventures in the Borderland Provinces. Other products, like the Gazetteer or main Borderlands Provinces book had info on the different regions in the area. I’d like to see a few more products like this. It’s nifty. And it’s only $6 as a PDF at the Frog God site. So glad to see someone still running MERP, one of my favorite games. Thanks for the heads up on these different products, I’m not familiar with Mr. Kelly’s work or the Old School Adventure Accessories. They look like they’re worth a try. Precisely how “favorite” is MERP to you? If you’re not already, it sounds like you’d make a good member of (ICE) Middle-Earth Role Playing Facebook group. They’re fine, likeminded people over there, and the group is more active than other groups I’ve been in. Alas, I am not on Facebook, but perhaps I need to investigate this ICE MERP group. Adamant Entertainment’s “Thrilling Tales” has a pretty good pulp inspired one at the end of the main handbook; basically how to generate Indiana Jones-style plotlines. I think that Michael Curtis’ ‘The Dungeon Alphabet‘ was an early collection of random generation tables. Goodman Games put out a third edition not too long ago. Mick Gall: Thanks for the tip! I’ll try to find a copy of that one. It should be real interesting to compare it to the Conan 2d20 generator since both products seek to emulate pulp fiction specifically. Tony Den: Glad someone got some use out of this! Bob: I didn’t realize The Dungeon Alphabet had tables! I always assumed it was a clever and humorous “primer” for old school dungeon play and cliches. I’ll look more closely at it. Yeah, thumbs up for the Thrilling Tales adventure generator as well — I think it was consciously modeled on the one they used for Doc Savage? but they split some of the categories even further. If I were ever to decide I wanted to try my hand at fiction writing, I’d be awfully tempted to use something like that, just for inspirational purposes. Joe H.: Trying my hand at fiction writing, and have used things like this. Then a table comes out. Honestly, a lot of fun of writing is the joy in trying to figure out a good way to fit item from table into story. Great post. I happen to have all of those products myself, and highly recommend them. I also highly endorse the Raging Swan series of encounter books. While written as Pathfinder centric, the line has also been printed as system-neutral, or you could simply ignore the Pathfinder mechanics and just use the wonderful tables. Urban Dressing, Wilderness Dressing, 20 Things etc. are all good. Thanks for comparing notes, Howard! I’m going to check out the image links to products I don’t recognize. And I VERY MIUCH recognize the Hex Crawl Chronicles. I was attempting to start my terminated Swords & Wizardry campaign in the first one. Even though I sadly think I might not ever be able to use the products, I got EVERY SINGLE ONE OF THEM in physical copy for an absolute steal ($2 a piece, if I remember right) last year at Garycon. Oh, yeah!